The mood was tense Tuesday afternoon as State Department Spokesperson Jen Psaki faced the press to field questions about closures of American embassies and consulates in nineteen countries. Other topics covered included NSA leaker Edward Snowden, an upcoming meeting with Russian officials, and recent events in Egypt. Journalists launched into tough questions regarding this weekend's emergency warnings given to U.S. citizens in countries like Yemen, Egypt, and Iraq. Psaki declared the unspecified threat "one of the foremost national security threats we face." When asked to elaborate on the current threat level, Psaki pointed vaguely to successes in "decimating al-Qaeda leadership" in Afghanistan and Pakistan, but also acknowledged that the State Department remains "concerned" about al-Qaeda affiliates in the Arabian peninsula. Psaki did not specify when evacuated U.S. personnel would return to Yemen. One journalist pointed out that as long as leaders like Ayman al-Zawahiri remain alive, we cannot claim to have decimated the threat of al-Qaeda. Al-Zawahiri is "the one central figure coordinating in the region" who allegedly issued the order for an attack in Yemen that triggered this weekend's warnings. The briefing also focused on this Friday's upcoming meeting between U.S. and Russian officials. When asked if the State Department would ask Russians to revoke the asylum status given to NSA leaker Edward Snowden, Psaki said tersely, "We would like Mr. Snowden to be returned to the United States." She also discussed the hope that Russian Foreign Affairs Minister Sergei Lavrov might be able to bring Syrian President Bashar al-Assad to the table for future negotiations on the conflict in Syria, despite recent setbacks suffered by Syrian rebels. Associated Press reporter Matt Lee brought his usual snark to the conversation, needling Psaki on just about every topic that came up. In one uncomfortable exchange, he asked repeatedly whether or not the State Department had decided to call last month's takeover of the Egyptian government a "coup." Psaki refused to budge on her original statement, "Our position is that we do not need to make a determination." 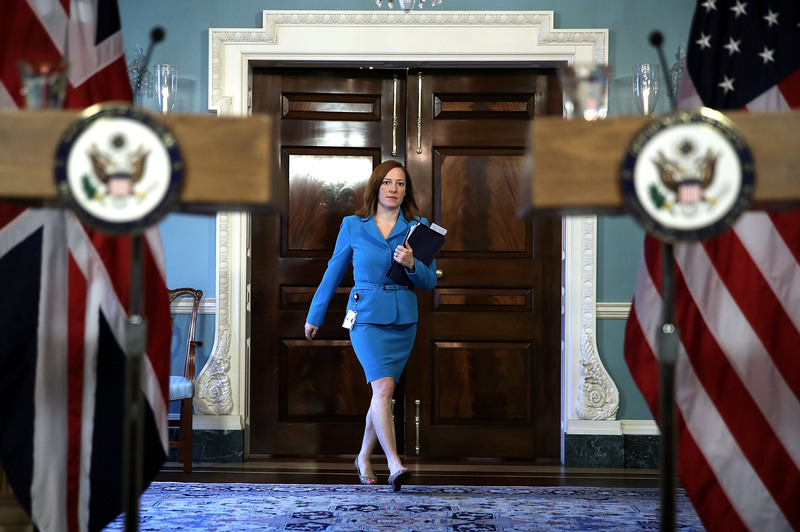 We hope there was a pillow backstage for Psaki to scream into, because she was just put through the wringer.